I love the glorious aroma of freshly baked home-made bread. However I have limited bread making skills and I am rather scared of using yeast so other than occasionally making focaccia I tend to stick to baking breads that don’t require it. 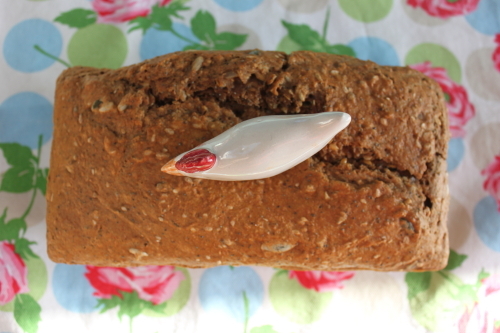 The yeast free spelt bread pictured above is very easy to make; it is just the thing when you want to cut back on your wheat intake and it tastes delicious. The recipe comes from ‘Cornucopia at Home: The Cook Book’. First preheat the oven to 180° and prepare a 900g loaf tin by brushing it with oil. Then put all the dry ingredients into a bowl and stir to combine them thoroughly. In a separate bowl or jug mix together the treacle and the water, the easiest way to do this is to start with the treacle and 50ml of the water, blend these together thoroughly before adding the remaining 500ml of water. Make a well in the centre of the dry mix then pour in the liquid and use a spoon or your hand to combine it with the dry ingredients to create a soft sloppy dough. Transfer the dough to the prepared loaf tin and pop it in the preheated oven for approx one hour, until well risen and nicely browned. Turn the loaf out on to a wire rack (to test for doneness tap the bottom of the loaf and if it sounds hollow the bread is cooked). Lastly cover the loaf with a clean tea towel and leave to cool before slicing. Note: If you are missing some of the seeds you can make up a total of 150g of mixed seeds from what those you have to hand. I am not a sesame seeds fan, but will try this recipe without seeds. The smell of bread is simply sensational! I love the variety of seeds you use in this. So do I. Thanks for your comment. This looks yummy. Yeast, especially dried yeast, is really easy to use. You can either mix it with a bit of warm water with a little sugar or honey, and let it froth up, or just put all the ingredients together in a food processor and mix it using a dough hook. I usually do the latter, put it in an oiled bowl, cover and let it do it’s thing – too easy. I think I need to be braver when it comes to using yeast. Thanks for the encouragement to use it, you make it sound easy.